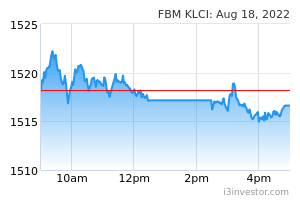 The FBM KLCI erased all its intraday gains as the key index closed lower to around the 1,674.52 level yesterday. The MACD Histogram has extended another green bar, while the RSI remains in the oversold level. Resistance will be pegged around the 1,690-1,700 levels. Support will be set around the 1,660 level. 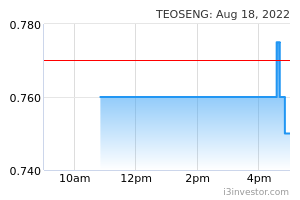 TEOSENG has rebounded to close above the EMA9 level with improved volumes. The MACD Histogram has extended another green bar, while the RSI remains below 50. Price may trend higher, targeting the RM1.34 and RM1.42 levels. Support will be pegged around the RM1.16 level. 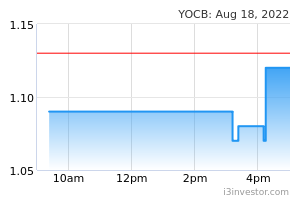 YOCB has formed a breakout-pullback-continuation pattern to close above the RM1.19 level with improved volumes. The MACD Histogram has turned green, while the RSI remains above 50. Price may advance towards the RM1.24-RM1.28 levels. Support will be anchored around the RM1.14 level. 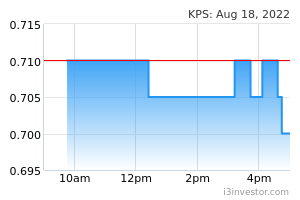 KPS has experienced a short-term consolidation breakout above the RM1.34 level with rising volumes. The MACD Histogram has extended another green bar, while the RSI is approaching 50. Price target will be envisaged around the RM1.46 and RM1.52 levels. Support will be set around the RM1.27 level.